Infinity War will have one major scene jam-packed with Marvel heroes. Three kaiju legends will appear in the next Godzilla movie. Daenerys returns to Westeros in a new Game of Thrones picture. Plus, behind the scenes on X-Men: Dark Phoenix, and a new War for the Planet of the Apes clip. Spoilers, roll out! 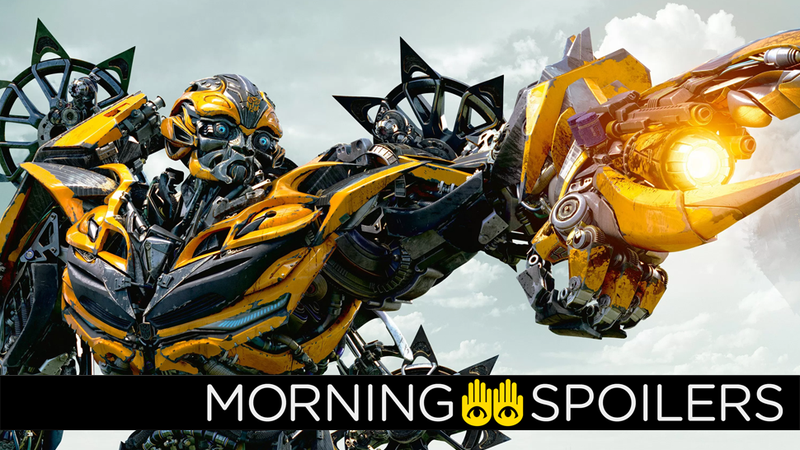 Speaking with Collider, producer Lorenzo di Bonaventura revealed the spinoff is set in 1985—and compares Bumblebee’s journey to The Iron Giant. I know we’re doing a spinoff first in the Bumblebee movie, and that is a very distinctive departure from what you’ve been seeing so far… The objective of that movie is to develop more time with less robots in a way, and to go back to 1985 and go back to sort of the original heritage if you would of the Transformers. So it has a very distinct idea in it, and then whatever is gonna happen with the chemistry is what’s gonna happen, but it really is a young female lead opposite Bumblebee. There are dramatically less Transformers. We hired purposefully Travis Knight, who is a very distinct filmmaker. You can’t compete with Michael – you’re gonna lose. Also I think the audience wants something different all the time, let’s keep them interested. They’re gonna get a very emotionally complex story, a very tight story in terms of its location and in terms of its storytelling. In fact it reminds me a little bit of Iron Giant years ago when I did that movie at Warner Bros. It just reminds me a little bit of that where it was very contained and yet it didn’t feel small. An official synopsis reconfirms that three of Godzilla’s most famous foes will appear in the movie: Mothra, Rodan and King Ghidorah. Belle Avery, the lead producer on Meg, is working with her Chinese producers to bring The Loch to the big screen … Screenwriter and director are their first priorities… and they are speaking to some serious talent. The Danger Room is under construction in the first set picture from the film. And here’s a video of James McAvoy teasing the return of Professor X. Bad Robot’s supernatural World War II movie is currently looking at an October 26, 2018, release date according to Coming Soon. While appearing as a guest on The Late Show, Scarlett Johansson said she believed there’s a scene with up to 32 popular Marvel characters appearing at once, presumably as some grand hero shot to remind you that there’s a lot of Marvel heroes running around these days. In one particular scene, I think there’s 32 — there’s a lot. There’s so many of us. I don’t even know who’s a Marvel character and who’s a crew member, honestly. We’re exploring this jungle and trying to conquer the game; it’s life or death,he said. But while we’re there, we find clues left behind by [Williams’ character Alan Parrish]. He built up a full-blown jungle house, similar to a Swiss Family Robinson situation. It’s like he’s there helping us without actually being there. J.A. Bayona is a completely different kind of filmmaker and thinker than I am, yet we do have a lot of things in common so I was able to craft something specifically for another filmmaker that I admire. I built a Spanish horror thriller with dinosaurs in it that I probably wouldn’t have built for myself. Jon Watts confirmed there will be multiple post-credits sequences at Supanova, to the surprise of absolutely no one on the planet. He even says they’re “worth sticking around for,” to boot! And here’s a two-and-a-half minute short film from Audi, in which Peter takes driving lessons from J.B. Smoove. You know, as you do. Here’s the longest version yet of a clip we’ve seen in various permutations: Hot Rod, Anthony Hopkins, Mark Wahlberg, and Bumblebee spout exposition in merry old England. Woody Harrelson monologues over the captured Caesar in the latest clip. Warner Bros. has released a new poster for the creepy doll origin movie. A new theater standee depicts the (seemingly) resurrected iteration of Colin Firth’s character, Harry Hart/Galahad, dressed in vaguely cowboy-ish attire of the Kingsman’s U.S. counterparts, the Statesmen. A new picture from Time Magazine has various cast members bobbing around in a rowboat—apparently taken from the first time Dany and her team land at Dragonstone. Finally, AMC has released another featurette on season two.